​ZenInPicardie is proud to announce that we have been recognized by the TripAdvisor community with a 2017 Certificate of Excellence. The Certificate of Excellence is awarded to accommodations, attractions, and restaurants that earn excellent reviews from guests on a consistent basis. With more than 60 TripAdvisor reviews to date, we are honored that so many of our guests have taken the time to share their experience on TripAdvisor and are humbled by their positive and warm feedback. 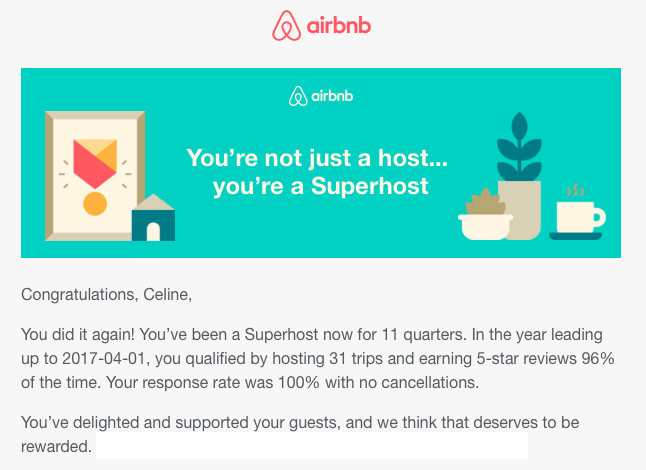 Today we are proud to announce that we have received again the prestigious Superhost status from Airbnb, not only a very hard earned accolade, but also one that we take very seriously and have worked hard to obtain. A huge thank you goes out from us to all of you today who have taken the time, over the past few years, to review us honestly about your time with us, without you this would have been impossible, thanks! Recognition like this is very rare to obtain inside such a short time frame and for that reason we are even more proud to receive it today, knowing that it’s true reflection of ZenInPicardie, it’s growth, our family and our awesome clients. 100% GENUINELY earned ! ZenInPicardie Vacation Rentals has been awarded 5-Star ranking by the French Ministry of Tourism for vacation rentals, which is good for 5 years. Less than 5 vacation rental owners out of more than 2000 can claim this honor in the Picardy region. The classification is obtained following months of preparation and a gruelling on-site examination by the regional government tourism organisation. Very strict factors must be adhered to for the comfort of guests. For example, bed size is examined, as well as the type of garden furniture offered. We at ZenInPicardie are very proud that both our vacation rentals, Plein Ciel and Cozy Cave, received this coveted award, assuring our guests of the quality of our accommodations and service.